Take the battle online with an unparalleled multiplayer experience. Halo: Reach expands on the industry-leading suite of features found in Halo 3, including four-player cooperative campaign play, splitscreen support, saved films, screenshots, and exciting new surprises that have yet to be revealed. Trending at $32.68eBay determines this price through a machine learned model of the product's sale prices within the last 90 days. Halo: Reach (Microsoft Xbox 360, 2010). Condition is Like New. Shipped with USPS First Class Package. I have taken detailed photos to show the overall condition of this item. This item has been tested and works. Exceptions can be made on an individual basis, communication is the key! 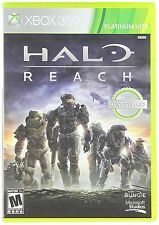 BRAND NEW Sealed Halo: Reach -- Limited Edition (Microsoft Xbox 360, 2010). Condition is Brand New. *Fast shipping* Factory sealed, they do have wear and plastic may be slightly ripped/tore due to being on the shelf. Halo Reach Limited Edition for Xbox 360. Shows minor shelf wear (see pics). Halo: Reach Xbox 360 Disc Complete with manual. Condition is Like New. Shipped with USPS First Class Package. Halo: Reach Legendary Edition (2010) original, complete contents with statue (No DLC). Condition is Like New as the only item that has been 'used' is the disc itself. Noble Team statue expertly crafted by the artisans at McFarlane Toys. Halo Reach - Xbox 360. BRAND NEW Sealed Halo: Reach -- Limited Edition (Microsoft Xbox 360). Condition is Brand New. Shipped with USPS Priority Mail. Comes from a clean smoke free home. Thanks. Halo: Reach (Microsoft Xbox 360, 2010). Condition is Very Good. Shipped with USPS First Class Package. (Item #ZB002BSA20MZ2|0). Condition: Very Good. Halo: Reach XBox 360 Complete. Condition is Very Good. Shipped with USPS First Class Package. New ListingHALO: REACH MICROSOFT XBOX 360 GAME COMPLETE TESTED & GUARANTEED!!! 4.5 out of 5 stars - HALO: REACH MICROSOFT XBOX 360 GAME COMPLETE TESTED & GUARANTEED!!! 875 product ratings875 product ratings - HALO: REACH MICROSOFT XBOX 360 GAME COMPLETE TESTED & GUARANTEED!!! This listing is for the Halo: Reach Xbox Preview Disc. This disc was released for the Xbox 360 preview program and is now a great addition to any serious Halo fans collection. The game itself may have minor wear and the packaging may be damaged and missing the instruction manual. Halo Wars Halo Reach (Xbox 360). Condition is Very Good. Shipped with USPS First Class Package. Halo Reach - XBOX 360 Video Game - BRAND NEW, FACTORY SEALED! 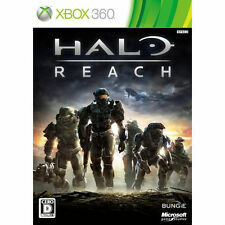 Halo Reach for XBox 360. 4.5 out of 5 stars - Halo Reach - XBOX 360 Video Game - BRAND NEW, FACTORY SEALED! 875 product ratings875 product ratings - Halo Reach - XBOX 360 Video Game - BRAND NEW, FACTORY SEALED! 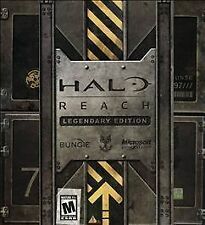 Sealed box containing Halo: Reach - Legendary Edition. Entire contents of Halo: Reach Limited Edition. Box is sealed and has never been opened. Part of my own personal collection. Outer sleeve has one tiny mark. Brand new sealed Halo limited edition. Only one small rip on the front on the film wrap, but the rest is in perfect conditions. see pics for details. what you see is what you get and it is ready to ship! Contact me if there is any question. Happy bidding Sorry! No international shipping. 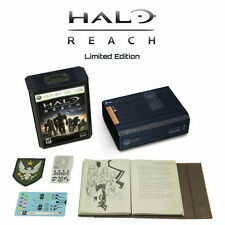 Halo: Reach - Limited Edition & Includes a BONUS: The Original Halo Game! 5 out of 5 stars - Halo: Reach - Limited Edition & Includes a BONUS: The Original Halo Game! 24 product ratings24 product ratings - Halo: Reach - Limited Edition & Includes a BONUS: The Original Halo Game! Title : Halo Reach. The original artwork is included. The manual may or may not be included. Plastic may have slight tear in it as shown in 2nd picture. The planet Reach is humanity’s last line of defense between the encroaching Covenant and their ultimate goal, the destruction of Earth. If it falls, humanity will be perched on the brink of destruction.Product Features. 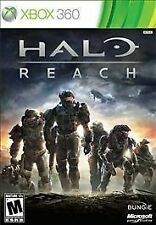 Halo: Reach - Xbox 360 Game - New Sealed. Condition is Brand New. Shipped with USPS First Class Package. Halo: Reach takes a significant leap forward with all-new engine technology representing the next generation of art, audio, AI, animation, and Hollywood-style special effects. An Intense and Epic Campaign. Manual is in crisp and clean nice and flat very good condition. Halo: Reach Microsoft Xbox 360 *New! *Sealed! *Free Shipping! 4.5 out of 5 stars - Halo: Reach Microsoft Xbox 360 *New! *Sealed! *Free Shipping! 875 product ratings875 product ratings - Halo: Reach Microsoft Xbox 360 *New! *Sealed! *Free Shipping! Release Data Release Date Box text This Product is USED. Number of Players . Halo: Reach (Microsoft Xbox 360, 2010). Condition is Brand New. Shipped with USPS First Class Package. Halo: Reach -- Limited Edition (Microsoft Xbox 360, 2010). Condition is Good. Trending at $9.59eBay determines this price through a machine learned model of the product's sale prices within the last 90 days. HALO: REACH MICROSOFT XBOX 360 GAME COMPLETE TESTED & GUARANTEED!! !